Have you met Nancy yet? Ahhh!!!! You are my hero Magic Crochet Fan! Thank you SO MUCH! Here is the full size picture too LOL! I'd definitely hand wash cold/dry flat with this yarn. Fiber Content :10% Wool, 40% Acrylic, 35% Micro Polyamide, 15% Polyester. 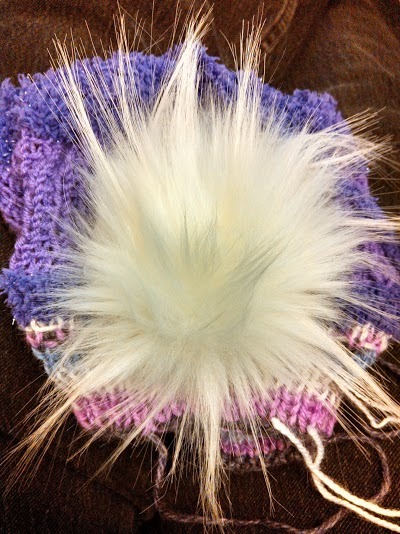 The pom pom feels like its made with the fluffy "fake fur" and the fibers are pretty well intact. I'm about 2/3 done the knit hat (loving how its coming out) then I'll work on a crochet one. Honestly - I will be picking a very basic slouchy hat pattern and just let the yarn "do the work" I love when its that easy haha. I'll find one but it won't be my own. The pom pom is included but separate so you tie it on yourself. Thank you. I didn't realize there was a specific place for indie shops to advertise.